Despite massive safety improvements in truck technology, the chances of a truck driver getting home safely have not improved much in the last 7 years and in 2014 they slid backwards big time. Attitudes are changing in the industry, but we need better commitment and active steps to follow up with action. According to MOT stats, heavy vehicles are involved in nearly a fifth of all road fatalities – twice as many as could be reasonably expected when looking at the number of trucks on the road. Since 2008, there have been two fatal crashes for every 100 million truck kilometres travelled. A CANSTAR survey out this week suggests that 1 in 3 people are “OK” using a cell phone whilst driving. NZTA says that texting drivers are 23% more likely to be involved in a crash. I’m disappointed every time I see a truck driver on a hand held cell phone. That’s a lot of disappointment to fit into a day I can assure you. These statistics are starting to make their way into the mainstream media which will ultimately result in more pressure and / or stricter controls on safety management – one possible consequence could be toughening up of the Operator Safety Check – affecting your ability to run your HPMV and 50 Max trucks up to capacity. • 25% of truck – trailers on the road are HPMV and these aren’t the only new trucks put on the road. Newer trucks mean more technology to avoid or survive a major crash. 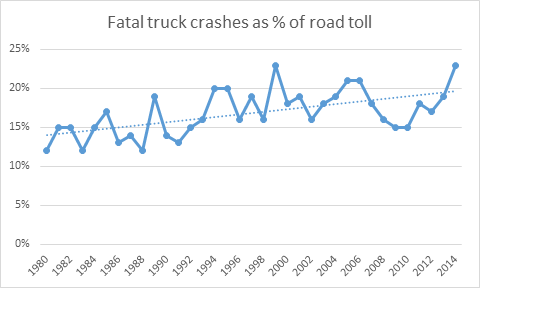 • Surveyed trucks speeds have dropped from almost half of all trucks being over 90km/h at point of survey in 2005 (after the speed limit was lifted to 90km/h for trucks) to less than a third last year. So better, but as an industry, we still need to do more to improve the crash stats. By the time you read this, the new H&S rules will be in place, meaning fines of up to $3m for failing to look after your staff. The ORS certainly has its drawbacks, but what I am seeing is the good operators are getting the 4-5 star ratings and the rest are not. This suggests that overall the system is about right. Your 6 monthly ORS report tells you what is going on in your fleet in the factors that you can’t easily monitor using your systems. Sharing facts and figures, stories, and building competitions (we could get all up to date and call this gamification if you prefer) around the best and most improved drivers is the way to do this. If you need help getting started, please ask.